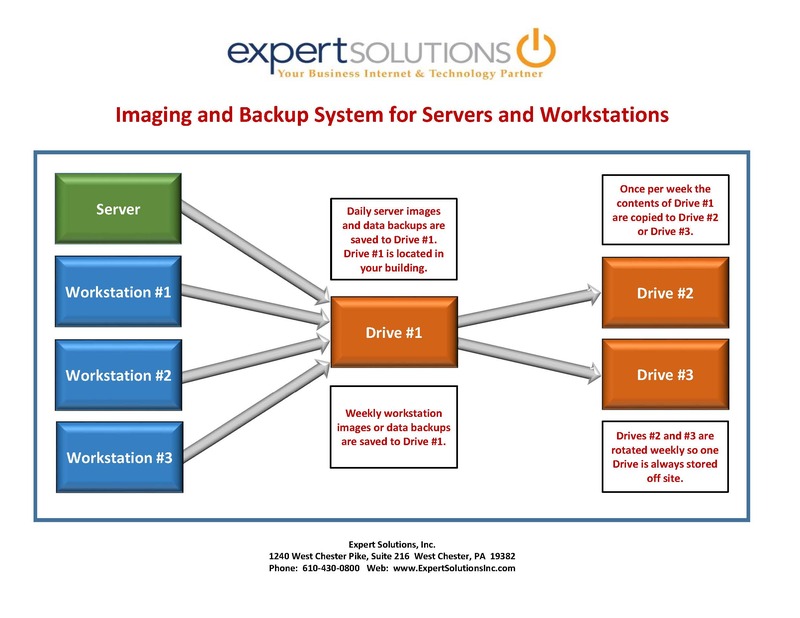 Backup Recommendations | Expert Solutions, Inc. The following system is a “game changer” in the way your business data can be backed up. Although a lot of information is presented, I urge you to take ten minutes to read and consider adopting this new system. Backup – This is a copy of data files only, not the configuration (programs, the operating system, user rights and permissions, printers, desktop settings, etc.). A backup can only be used to restore data files. Image – This is a snapshot of the entire hard drive. The image contains everything that is on the hard drive including data files and the configuration (as described above). As a result, when an image is restored, it brings the computer back to its previous working state. In addition, individual data files or folders can be restored from an image. Comprehensive images and backups of your server(s) and workstations are critical to provide a method of recovery for your valuable and irreplaceable business information in the event of a hardware or software failure, a computer virus, or loss of your computer system due to fire, flood or other disaster. Consolidate and simplify the configuration and management of your existing backup process. Create and store additional copies of server images, workstation images and server data files. Significantly reduce the time and cost to recover lost or damaged data and operating systems. Provide temporary access to data, and many applications, in the event of a server failure. We have just completed revising our recommendations for server and workstation images as well as data backups, utilizing this new technology. These new recommendations can be implemented with a modest investment in new data storage drives and specialized workstation imaging software. Drive #1 will remain in your office to accumulate the various images and backups during the week. Drive #2 will be used to create a complete backup of Drive #1 so the contents of Drive #1 can be stored off site. Drive #3 will contain a copy of the previous week’s images and backups and will be stored off site. The new storage drives will replace the external hard drives or tapes currently being used for your existing imaging and backup system. Because of the large storage capacity of the new storage drives, many additional copies of your network server images and data backups can now be stored. As we have previously communicated, creating workstation images is extremely important to provide a method to recover lost or damaged data, and the overall configuration of each workstation. Without an image, recovering data and reinstalling the operating system, and all the applications, can take many hours of work. Therefore we want to reemphasize the need to begin creating hard drive images of all the workstations in your office. We recommend option #2. Acronis is a far superior system compared to the Windows utility. It is much easier to configure, manage, and it allows for restoration of drive images to both their original workstations as well as new, different workstations. Test restoring server(s) images to a server in our office to confirm the image is viable, that it will work on a different server, and to document any unique steps needed to complete the restoration process. This testing should be done at least once per year. Test restoring workstation images in our office to confirm each image is viable, that it will work on a different workstation, and to document any unique steps needed to complete the restoration process. Test opening and running applications on the new storage drives as well as on our test server and workstations. This process will identify any special requirements for restoring applications in the event of a server or workstation failure. In addition to storing images and backups, the new storage drives will be capable of being set up as a temporary network file server to allow access to most of your data files and possibly run your server applications, until the server is repaired are replaced. The time required for this process will vary based upon the number of server applications being tested and the number of workstations that run specialized applications. Generally most workstations do not run specialized applications so this testing time should be minimal.